Kiss 92 is the place to hear all the great songs. The radio station is located in the capital city of Singapore and it's transmitted through the 92.0 FM. 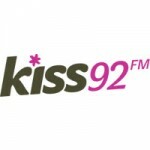 Kiss 92 is another of the most popular radio station in the country.